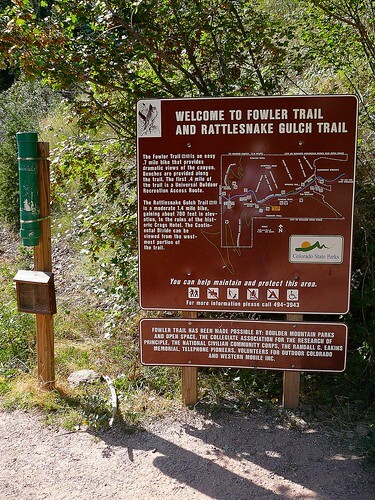 WELCOME TO THE FOWLER TRAIL AND RATTLESNAKE GULCH TRAIL The Fowler Trail is an easy.7 mile hike that provides dramatic views of the canyon. Benches are provided along the trail. The first .4 mile of the trail is a Universal Outdoor Recreation Access Route. The Rattlesnake gulch Trail is a moderate 1.4 mile hike, gaining about 700 feet in elevation, to the ruins of the historic Crags Hotel. The Continental Divide can be viewed from the west-most portion of the trail. You can help maintain and protect this area. For more information please call 494-3943 Fowler trail has been made possible by: Boulder Mountain Parks and Open Space, The Collegiate Association for the Research of Principle, The National Civilian Community Corps, The Randall C. Eakins and Western Mobile Inc. This entry was posted in Protect Colorado and tagged Canyon, Eldorado, Park20, State. Bookmark the permalink.